← So You Think You Can Sing Opera? At first, I was a little annoyed when people called us the “lemonade” company. Were some of us dealt a bad hand when the Baltimore Opera closed? You betcha. Did we try to make the best of a bad situation? You betcha. But I’m here to tell you, what we are doing with Baltimore Concert Opera is a heck of a lot more than making the best of a bad situation. To be fair, we probably would have never gotten around to launching this venture if the economy didn’t tank, and if we didn’t lose our grand opera company…so sure, we saw an opportunity and we grabbed it. I like to refer to it more as “never wasting a good recession” rather than “making lemonade.” It’s a slightly less sour cliche. The lemonade cliche was getting on my nerves until I came across the story of the movie, Lemonade. Neal Shaffer let me know about it when we were decompressing after IGNITE BALTIMORE 5. He was sponsoring a screening of the movie at THE WINDUP SPACE. I was bummed not to be able to catch it, but glad for the reason why (Made my debut with the Baltimore Symphony Orchestra that weekend). The more I started looking at clips from this movie, the less the lemonade analogy got under my skin. This movie is about people reinventing themselves, when they were dealt a bad hand….layoffs that seemed to be world-ending, were really just new beginnings for some. The more I thought about it, the more I realized that this was exactly what I was experiencing at a very personal level. For years, I pursued dual careers in opera performance and real estate sales. As much as I love both, the Baltimore Concert Opera was my lemonade…my chance to reinvent myself, and to experience the intersection of my very distinct skill sets. It has been a quite a gift, that has given me a refreshing perspective on the world of opera. I have new energy, new goals, new ideas…and an incredible platform for them. For years, I effectively marketed bricks and mortar…and wonderful as it has been to connect with people in the real estate business, to help them find homes, to shepherd them through negotiations, to help them find bigger houses as their families grow, I was still marketing houses….something that inherently is pretty tough to care about. What if I used my skills that I had picked up in the real estate business…the so called “innovative techniques” that my partner and I were getting some nice press for, to market something I was truly passionate about? After years of pursuing what seemed to be diametrically opposed careers, I finally figured out what I wanted to be when I grew up! The learning curve was bound to be steep…but we had a pretty great case study on our hands, and an audience that was hungry (or I guess thirsty, if I’m going to stick with the analogy) for our product. So, as we get ready to close our first full season with Baltimore Concert Opera, I thought I’d chronicle the growth of our “lemonade stand.” Perhaps we can use it as a tool to continue to learn from our mistakes, as well as our triumphs. Below, I will hit some of the high and low points of our first year. What are you doing to capitalize on the downturn in the economy? 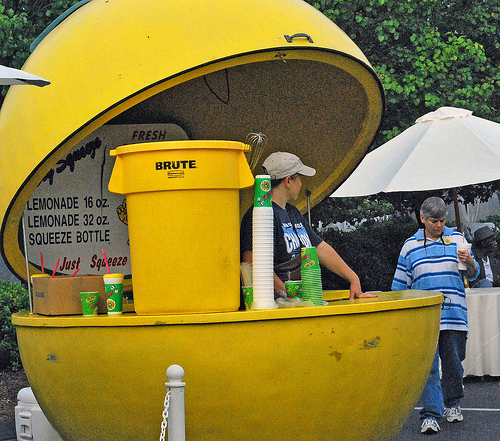 Do you have a lemonade story? As the project gained legs, we realized that we’d need some funding, and that would be tough to come by if donations were not tax deductible. With the help of the Maryland Lawyers for the Arts, we were connected with Ben Schuman at D.L.A. Piper (another singer who reinvented himself, just in a better economy) who would help us with our 501(c)(3) application. We assembled a cast of friends, willing to help us mount a reading of Mozart’s Don Giovanni…what a cast it was, and they all committed to doing it, knowing that we might not be able to pay them…just because they wanted to help us get off the ground. The opera starved audience in Baltimore crammed into what I like to refer to as the “Irish Wake” for Baltimore Opera. Many familiar faces came out in support, for music, drinks, and fellowship. There were also, much to our delight…some new faces…younger ones. Our $17 advertising budget had to get stretched pretty far, and we utilized every social media outlet we could find. Thankfully, we were blessed with a “standing room only” turnout for our debut. Read Tim Smith’s initial thoughts here. We followed Don Giovanni with a concept that was frankly designed to save money, but we thought we could sell anyway. A Flight of Puccini featured three different acts from three different Puccini operas, again we were blessed with a sell-out crowd, and a favorable review. We’re following up this concept this year with A Flight of Verdi, which ends our 2009-2010 season. July proved to be a very busy month. We held our first So You Think You Can Sing Opera? auditions. What a thrill it was to hear so many fabulous artists, many of whom are featured in our 2009-2010 season! Live audience members were treated to some terrific singing, in a fun atmosphere…complete with applause-o-meter! Here is one of the highlights…Tim Augustin, knocking our socks off. Tim went on to sing Ernesto for us in Don Pasquale. Faust. Faust represented a HUGE leap of faith for our young company, but proved to be a risk worth taking. This marked the first time that we employed a fully professional chorus, made up almost entirely of our colleagues from the former Baltimore Opera Company, and prepared by the extraordinary James Harp. Take a quick listen to our dear friend Jonathan Carle, with the best back-up band in town, singing the death of Valentin. This fabulous group of musicians add depth, beauty, gravity and excitement that is truly unmatched. To the extent that our budget will allow, we’ll be honored to have them any time! Tim Smith agreed…see his thoughts here. As part of the “Free Fall Baltimore” festival, we were awarded another grant from BOPA. This time, we collaborated with the other two ARTIST IN RESIDENCE groups at the Garrett-Jacobs Mansion, Concert Artists of Baltimore and the 4-East Guitar Quartet. The BCO’s offering was excerpts from La Boheme. The audience, thanks to BOPA was treated to a free evening of beautiful music in the mansion. I hope we can present a similar program this year! This event still “smarts” a little, but I stand by our decision to think “outside of the box” and try new things. There is a quarterly business networking happy hour at the Engineers Club. I’ve been to many of them as a part of my other life. I was convinced that we could really surprise folks and bring in a new audience for our product. I envisioned hundreds of business men and women, expecting to be bored with another power-point presentation, being overcome with the beauty of the music that we’d provided for them. Sadly, bad weather kept the crowds away. The half dozen people that showed up were treated to a fabulous time! This was a leap that fell short…thankfully, we learned some important lessons from this as well. Not everything we touched was going to turn to gold, and we needed to ratchet up the marketing efforts…we needed to go guerilla. November brought us our first comedy, Donizetti’s Don Pasquale. Although sales were not as brisk as we’d have liked, we learned a lot about our audience and our product. Don Pasquale brought us the debut of our new and improved supertitle screen. Have I mentioned that all of our performances are in the original language, with projected supertitles? What an education/undertaking that has been…but that’s for another post!~ We had a ton of fun with Don Pasquale, and learned that a comedy can be effectively done in our format. As we had done with Don Giovanni, the larger recitative portions were trimmed and replaced with a narration. This format worked very well for us, and I think that the opera “newbies” in particular enjoyed the formula of : (5minutes of fabulous music + 30 seconds of irreverent narration) = (</= comfortable attention span). We continued our season in March with the double bill of Cavalleria Rusticana and Pagliacci. Again, we were treated to our legendary Baltimore Opera Chorus, prepared by James Harp. Cav/Pag represented great growth in sales. Our Friday performance was four seats shy of a sell-out, and Sunday was not far behind. Our stellar cast brought these fabulous pieces to life, under the baton of Maestro Anthony Barrese. With all of the traffic challenges that this piece could present in our small venue, we were thrilled to have the help of Kristen Barrett to make it all look good too! These verismo pieces don’t lend themselves as well to the concert format as some of our others, and a little bit of “business” goes a long way, in terms of bringing the drama to life. Although we will never be a fully staged opera company, we’ve certainly filed away some thoughts and ideas that we learned during Cav/Pag, in order to make this genre more viable in the future. We were treated to our first lackluster review, but were grateful to have press there in any event, regardless of whether or not we agreed with the opinion. I, for one, am thrilled that we are held to a very high artistic standard. I will not, however ever claim that what we put out there is a polished product. We ask a lot of our performers…two rehearsals, make it work, sing beautifully….I’m incredibly proud of those involved in Cav/Pag…to bring such complex and challenging music to such a high level in such a short period of time was truly remarkable. The most important data, our audience surveys, made us chalk Cav/Pag up in the VICTORY column. As part of our preparations for the 2010-2011 season, we held our second installment of our open auditions. This event brought us over 260 applications, and we were able to hear almost 90 singers. Most of the casting for our 2010-2011 season is complete, save a few holes that will need to be filled with subsequent auditions. People came from far and wide to sing for us, and the audience was treated to two nights of exciting singing. This event is always a terrific reminder to me of just how much talent we have in our own back yard! In a few short weeks, we conclude season number one with A Flight of Verdi. We welcome back some old friends, including Jonathan Carle, James Harp, Tom Booth and Steven White. We get to see some of the standouts of last year’s auditions, Karen Myers, Rolando Sanz, Lesley Anne Friend, and Matthew Curran. When the curtain closes on A Flight of Verdi, we will officially have our first full season in the books. It has been a year of excitement, growth, education, fun, work, work and work. We’re so grateful to those that have donated their time and treasure to make BCO a reality. Without the wonderful volunteers who have rolled up their sleeves, and the fabulous patrons who have opened their wallets, we simply could not do what we do! We’re excited at what lies ahead…stay tuned for our 2010-2011 season announcement! Finally, in ending the longest blog post in our short history…I want to (re) share a video that pretty much sums up our approach. A lot of what we have to do in order to expand the audience for opera is to overcome objections. It’s no accident this “public service announcement” features Matt Curran, who will be starring in our next show! Please forward this around to those that are “on the fence” about opera…tell them to give it a shot, we don’t bite! This entry was posted in Uncategorized and tagged Anthony Barrese, Artscape, Baltimore Concert Opera, Baltimore Office of Promotion and the Arts, Baltimore Opera, Baltimore Sun, Baltimore Symphony Orchestra, Ben Schuman, Brendan Cooke, DLA Piper, Engineers Club, Fabrizio Melano, Francesca Mondanaro, Free Fall Baltimore, IGNITE BALTIMORE, James Harp, Jonathan Carle, Karen Myres, Kristen Barrett, Lemonade story, Lesley Anne Friend, Maria Callas, Matthew Curran, Neal Shaffer, Nutrition Diva, Rolando Sanz, The Windup Space, Tim Smith. Bookmark the permalink. Thanks for the shout-out, Brendan! Lemonade is nothing to shake a stick at. I just wanted to mention another of BCO’s “outside the box” activities that have been very successful – the cabaret evenings at Germano’s Trattoria in Little Italy. Hearing some of Baltimore’s greatest singers performing some of opera’s best-loved arias from 10-20 feet away (and for only $10) was an entirely new experience for many audience members. Several people commented to me that the experience brought the immediacy of opera home to them in a way that no lavish production could do. Aside from allowing the BCO board members to exercise their chops (after all, a reinvented singer is still a singer), we’ve been so lucky to have special guests join us to knock the socks off the audience — we got to hear remarkable and intimate performances by Timothy Mix, Emily Ezzie, and Karen Myers, and even convinced New York-bound Sara Stewart to sing “Vissi d’arte” after a dinner of pasta and red wine. I’ve drunk the BCO Kool-Aid (er, lemonade), and can’t wait for next season! I should’ve added the disclaimer that I was bound to forget a number of things that went into this season…as the attorney on the board, perhaps you can remind me of that in the future! Of course, the cabarets at Germanos are a great time, and a great chance for opera newbies to get their feet wet. I’m sure that I’ve forgotten several other tid-bits, which is one of the reasons that I wanted to start this chronicle.